WETA, the special effects and design house behind movies like Lord of the Rings and District 9, has teamed up with Valve for a little cross-promotion, with some of its original designs to be featured in Team Fortress 2. For a while now WETA has peddled its own intellectual property (created by WETA's Greg Broadmore), that of Dr. Grordbort, seller of old-timey ray guns for combat against old-timey aliens. 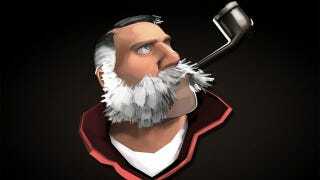 That universe, previously restricted to comics and high-priced collectibles, is now part of Team Fortress 2, a variety of items now available including a pair of guns, a pith helmet and a beard/pipe combo. That explains the rockets! oh, and there's also a new comic, available at the link below.